ALEJANDRO RIVERA P.A., A Law Firm, has three dedicated attorneys in the most common areas of the law. Our office hours are generally from 8:00am until 8:00pm Monday through Friday. We do have an emergency contact number that is monitored 24 hours a day 7 days a week as follows: 877-283-2282 We pride ourselves in being a reasonably priced full service law firm. We offer flexible payment plans if appropriate, and consult with clients after hours in emergencies. Our goal is to earn your trust and do as much good work as we can for as many people as we can help. The three Attorneys in our firm have significant experience in: Bankruptcy, Foreclosure, Immigration, Criminal Defense, DUI Defense, Immigration Law, Family Law, Guardianship, Probate, Divorce Law, and more. We do speak Spanish and have translators available in other languages. And, the first consultation is always FREE: We always want to talk to people with legal problems to see if there are things that our Kissimmee Law Firm can do to help. We also encourage you to find out more about us from our website: www.riveraatlaw.com Thank You, for taking the time to read this. Alejandro Rivera, Esq. Bankruptcy planning and implementation with a working plan in place for a "fresh start" after the case is over. We do a lot more than just Bankruptcy. We go to great lengths to give our clients options: Not every client needs a Bankruptcy !!! We analyze everything and explore different options with the Client that can be taken to address their problem(s). We sometimes can avoid a Bankruptcy by doing loan modifications, workouts, mediation. In cases where the client is being sued we can file as the Attorney of Record for the client and defend the clients rights in the case. If we successfully litigate for the client, this allows our client not to file the Bankruptcy if they don't want to. In foreclosure cases bankruptcy is a good option but, it is not the only option. We reach out to the Bank and or Homeowners association to see if we can avoid filing and try and hammer out a payment plan in lieu of filing a bankruptcy. In the meantime, we are working with you on bankruptcy planning. This is a very important step as people who better prepare themselves for a bankruptcy generally have a better outcome. We make sure you are fully informed on the most important aspects of your case, and know before filing all the possibilities that can happen and what to expect. We act as a team with you calling the shots on important decisions, and us guiding you as far as the legal ramifications that may come. And, when necessary readily offer our advice based on our many years of experience in dealing with these maters. We can also be here for you after the bankruptcy. With the other legal issues that you may have, or that may develop down the road. Our goal is to have 100% Client retention, we want you to call us first if you have a legal problem; Any legal problem. We always look forward to seeing if there is anything our Law Firm can do to provide for your professional legal counseling needs. Thank You, Alejandro Rivera, Esq. We are here to help people. That is why we became lawyers. Bankruptcy can represent "A Fresh Start" and can be viewed as an offer of forgiveness, for those who in good faith request it. I can think of nothing more important or better to do with my time as an Attorney than to help people receive forgiveness and obtain that "Fresh Start" in life. The Attorneys at our firm have the same bills as everyone else. We have struggled to pay for our education, worked heavy hours, held full time jobs, while struggling through college. And, we to, even as attorneys, have in the past made our fare share of mistakes. Now that we are attorneys, we are not here to judge you, we are here to help. That has been our calling in life, and that is why we have banded together, to form ALEJANDRO RIVERA P.A. A Law Firm in Kissimmee Florida. A reasonable law firm, with good intentions, doing the best we can to help as many as we can. Our firm is just the right size for you. 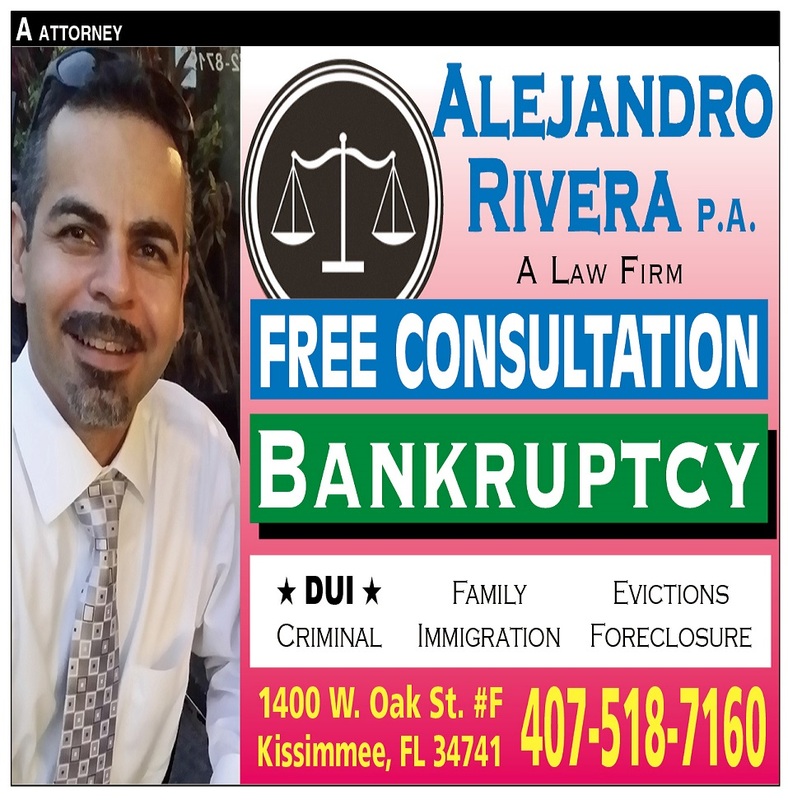 More than just one attorney so we can draw on the experiences of three attorneys to help you; Kissimmee Bankruptcy Attorney, Kissimmee Criminal Defense Attorney, Kissimmee Family Law Attorney. But, also, we are not too big so that it becomes very impersonal dealing with a "mega" corporation whereby you never develop a good working relationship with your attorney. We answer our phones, and always return phone calls. Are highly experienced in Bankruptcy and generally most if not all related areas of the Law that a bankruptcy client would also need us to have experience in (there are a lot of other areas of the law that can go hand in hand with bankruptcy especially with certain cases). These areas include (but not limited to): Foreclosure Defense Attorney, Property Law, Landlord-Tenant Attorney, Civil Litigation Attorney, Appellate Legal Work, Family Law and Divorce Attorney, Guardianship, Probate, and more. We are always glad to give a FREE consultation and listen to your concerns. Thank You, Alejandro Rivera, Esq. We consider it our ethical duty to ensure we do not waste the clients money. If the work can be done well by the junior attorney at a lower price then we ensure the client gets the lower price. That is the only way to do business. VERY OFTEN. If you have a good credit score and need a bankruptcy we will try our best to give you options to avoid the filing and preserve your score; Loan Modification, Mediation, Negotiation, Civil Litigation and Defense work, and more. But if in the end the alternative remedies do not resolve your case then we will zealously represent you in bankruptcy court against your creditors. It is important to note that Bankruptcy planning is a big part of our practice, we want you to be fully prepared for the filing so that you can have the best possible outcome in a bankruptcy. Yes, ABSOLUTELY. Many clients come to see us because they are being sued or have garnishments pending. We like to address all of the clients concerns, and have frequently helped our Bankruptcy clients by putting in limited appearances in their other cases. Since, we have three attorneys and a lot of experience, we can do more than just bankruptcy and don't hesitate when the client needs us to handle discrete parts of other cases to address those matters as well. After all, we are a Full Service Law Firm in Kissimmee looking to retain the client for future cases and for all their legal needs.